So a while back I did some terrain for a project that Dusk and Erwt were briefly working on called Elemental Wars. The project died pretty quickly, but I figured I might as well do something with the terrain so I've been adapting it into an AoS. â€“Instead of automatically respawning, players will be given a ghost when they die, which regenerates to 30 mana, at which point it can be revived at around 60% health and 0 mana. If the ghost revives the hero in a graveyard, he comes back with full health and mana. -There is also no need for fountains of mana, as hero mana regenerates very quickly in the map. -The center is very open. Having not actually played a full game on the map yet, its hard to say exactly how this will affect things, but I'm considering adding more trees/buildings to create more possibilities for ambush. 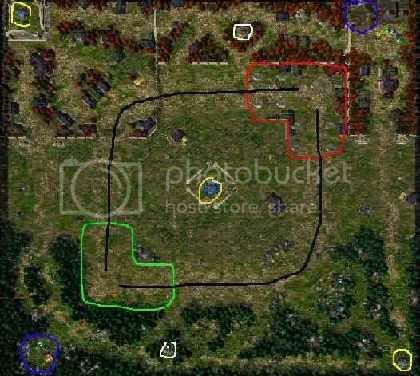 On the other hand, these possibilities already exist around the edges of the map and the middle is open for larger team battles along the edges of lanes. -The fountain placement. I don't actually remember why I placed the fountains so far from the bases; I suspect it was to create conflict over them and to prevent the defenders of the relatively small bases from having even more of a defensive advantage; I want games to be short and quick. -I'm also considering removing the waygates, as the map isn't particularly large anyway. Anyway, I know there's hardly anyone here anymore, but it'd be nice to get some feedback from people who actually know what they're talking about. Thanks!